A wonderful 1 bedroom apartment for 5 people in a beautiful and safe residential area of Pärnu.- Ülejõe. The apartment is located on the first floor of an auxiliary building of a private home (access through stairs outside the building). The apartment consists of a living room (2 beds on a couch/bed), kitchen, a roomy bedroom (3 beds), shower room and a separate WC. If required, two additional beds are available for additional fee. 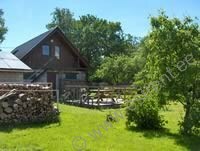 The cottage is surrounded by a large, well-maintained garden with fruit trees and berry bushes. The garden is an ideal place for spending one's free time, barbequing or having a picnic. The large yard makes it possible to organize various games (corona, volleyball, basketball, badminton, darts, croquet). Bicycles (2) are available for rent (separate agreement with the owner). Although the apartment lies in the immediate vicinity of the main building, the guests are guaranteed their privacy. Parking in a closed yard (free).